Speed is important to your website for a number of reasons. First, page load time is now a factor in the Google algorithm that determines how your site is ranked. Second, the average user on the Internet won’t wait more than a few seconds for your site to load before clicking the dreaded back button. That “click back” action, is also tracked by Google and factored into where your website ranks. Double whammy! 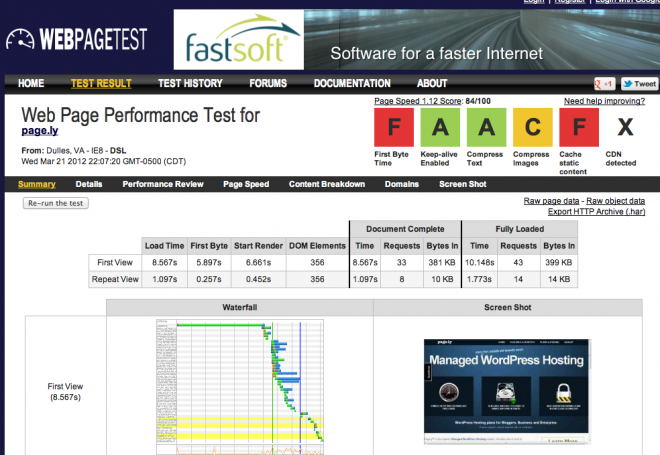 So, with that in mind, choosing the fastest managed WordPress host is good move. We’ve reviewed four major managed WordPress hosting providers here, and while they all have their pros and cons, we don’t have to choose the fastest one—the speed tests show for themselves—WP Engine takes the cake for being the fastest one! With the first page load, our tests proved WP Engine can load a decent website in under five seconds—almost twice as fast as Page.ly! What’s better, once the page is cached, the website will load in under two seconds… and you don’t have to do any of the caching or page load time reduction tweaks yourself, because WP Engine handles all of that for you! 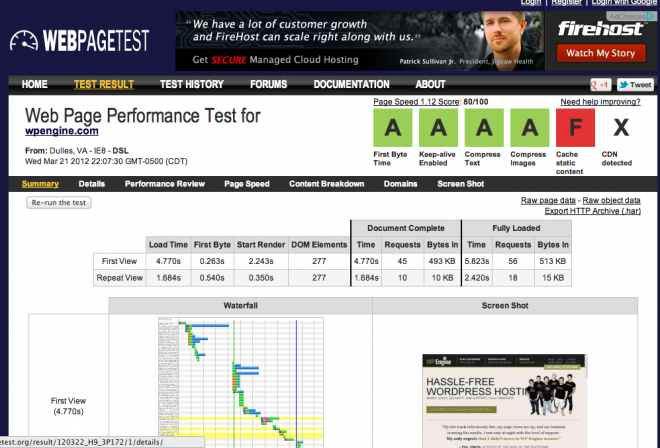 Below are two screenshots from WebPageTest.org showing the results of a speed test for Page.ly and WpEngine.com. As you can see for yourself, WP Engine is the fastest WordPress Hosting! WP Engine loads almost twice as fast as Page.ly. How does WP Engine handle speed? One thing that really sets WP Engine apart from the others is speed. When you look at the speed test above, you’ll see that WP Engine’s website is nearly twice as fast as Page.ly’s, which is a good indicator of how your website would load with each host. If you’re wanting to get better SEO benefits and more pageviews due to increased page speed, WP Engine is the way to go! Have questions about hosting speeds? Leave a comment below! Hey! Great website about managed WordPress hosting! Thank you. From what I’ve heard, WP Engine is simply great. Nobody seems to have a bad thing to say about them! I’m signing up through your affiliate link today! I did want to mention something, though. Their Personal plan offers CDN for an additional $19.95 per month. It may be that this is a new price change. I just thought you’d like to know.